Ann’s Music World wants to make getting your instrument as convenient as possible. You can purchase your instrument at the start of the school year. Or you can make monthly payments through our our rent-to-own plan. These payments are charged to your debit or credit card each month. 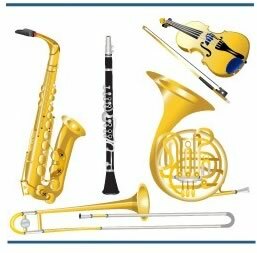 You can rent and pay for your band and orchestra instruments through our online store, which is available August through September. Select your instrument, the necessary book and accessories, and set up your payment plan in just a few easy steps. You also can choose to pick up your instrument in our Papillion store, or have it delivered to your student’s school for a small additional fee. You can also reserve your instrument online, and select the day and the store where you’d like to pick it up. You can complete the paperwork and submit payment in person. We’re familiar with your school’s program and your teacher’s requirements. Your instrument is in stock, cleaned and in perfect working order. Your instrument kit is packaged and ready when you arrive, including your instrument and whatever additional supplies are required. Ann’s Music currently serves the school districts listed below. If you don’t see your school district listed, please call us at 402-339-1659. © Copyright 2019 Ann’s Music World.